Sort Your Bookmarks by Label. Quickly find just the passage you’re looking for. Once you’ve created labels for your bookmarks, you can easily list them in label order. Select Multiple Bookmarks. 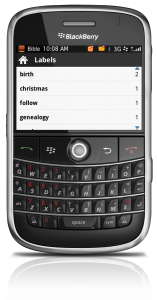 Managing your bookmarks on BlackBerry has never been easier. With this release, now you can select more than one bookmark at a time, so you can highlight them, apply labels to them—and even remove several at once. Easier Reading. The Bible App for BlackBerry previously allowed you to choose from one of three preset font sizes. But now you can specify the precise font size you want so you can make the most of your device’s screen resolution. More Connection Tweaks. Sometimes when your network coverage is unreliable, if you try to do several things at once, your BlackBerry may drop requests and then never complete them. New in this release, the Bible App now saves each request in a queue and monitors for a clean connection. And when you get a strong signal, it sends just one request at a time—rather than several at once. What this means is that now, when you can connect, more of your tasks will actually be completed, and in the order you initiated them. If you love the BlackBerry universe as much we do, then you’re probably aware of some of the unique challenges presented by the diversity of its devices’ capabilities and the network’s complexities. We’re committed to constantly improving the Bible App’s performance on as many BlackBerry devices as we realistically can, whether that means simplifying code to make functions faster or applying technical workarounds to address common network connection issues. 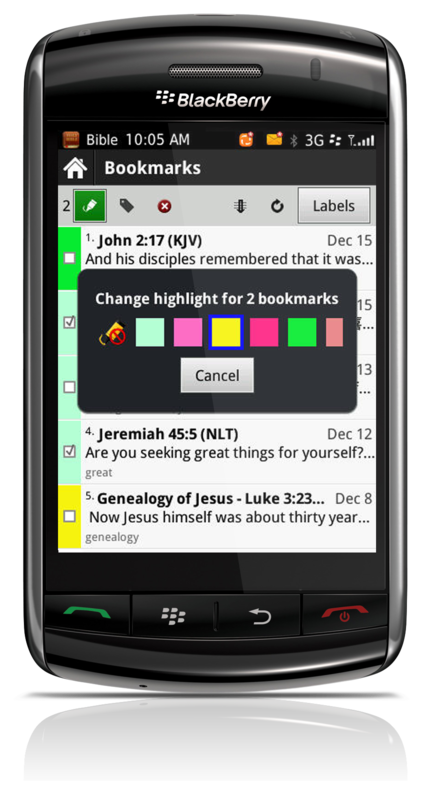 Please share the news of this Bible App for BlackBerry release with your friends. To truly get the most from the Bible App for BlackBerry, you’ll need a free YouVersion account, which takes just a couple of minutes. In exchange, you’ll get immediate access to more than 200 Reading Plans (in 10 languages! ), Notes, Bookmarks, and so much more. 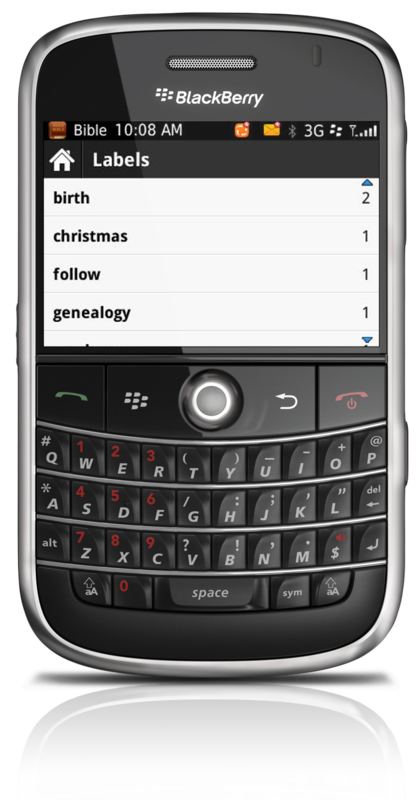 And we’d love to hear your stories about the Bible App for BlackBerry on Facebook and Twitter! Faster Performance. The Bible App now responds much more quickly, especially for the features that most of you use most—like Notes, Bookmarks, and reading plans. Reading Plan Caching. If you often find yourself with a slow or weak network connection, then sometime when you notice you happen to have a strong signal, you can jump into the Bible App and flip ahead through the next few days of your reading plan. 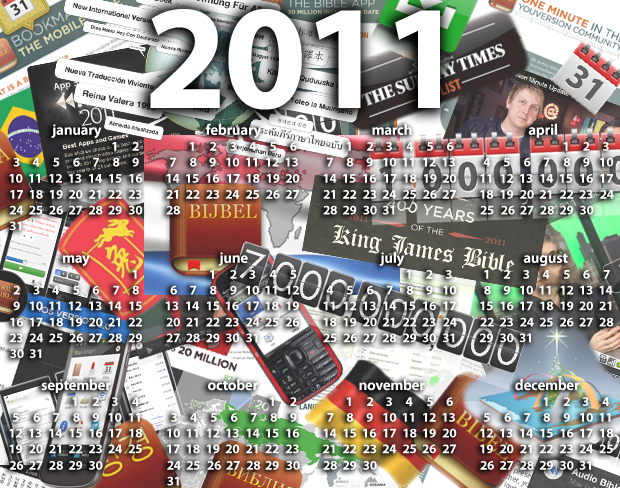 Each day that you view will be stored (cached) into your device’s memory. As long as you don’t completely exit the Bible App (which you can set in the Options on your Home screen), then when you come back later, those days will still be there, and that dreaded “No network available” message won’t interrupt your daily reading. Active Network Scanning. The Bible App now constantly monitors your network connection, adjusting settings in the background to try to maintain your signal. It also logs what it determines are its optimal settings, so that in the event your signal is completely lost, it can help you get reconnected as quickly as possible. Customizable Network Settings. For the first time ever, from right inside the Bible App, you can actually manually tweak your connection settings (shown). This new feature will let you experiment to find the strongest signal possible, or to disconnect on demand to avoid unnecessary data charges. 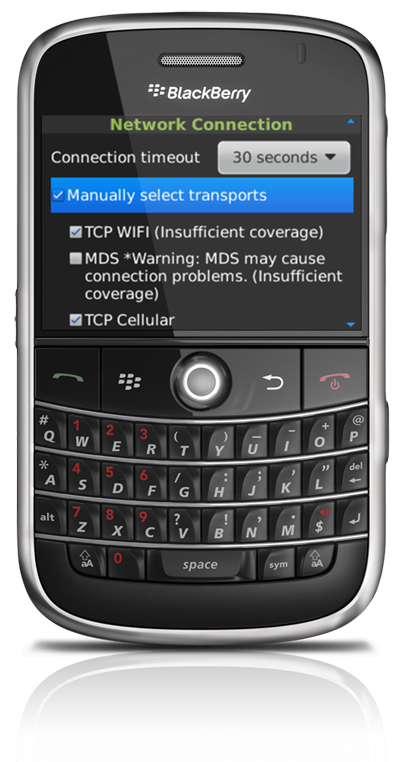 If you have a BlackBerry, then you know that for all their terrific functionality and usefulness, sometimes these devices can present unique challenges. 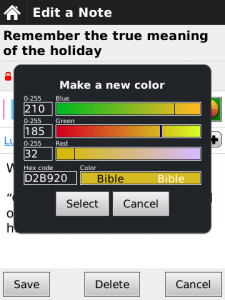 We continue working diligently to keep bringing you the best Bible experience possible on your BlackBerry. If you have friends with BlackBerry devices, please consider telling them about the Bible App—perhaps even helping them install it. As always, all they’ll need to take full advantage of its best-in-class features—reading plans, Notes, Bookmarks, and so much more—is a free YouVersion account. And please come connect with us on Facebook and Twitter to let us know how you’re using the Bible App! Bookmarks. Bookmarking on your BlackBerry device works pretty much the same way it has for a long time, where you simply tap on what you want to mark, then select Bookmark. Only now, for the first time ever, you can select multiple verses at a time! But you’ll find a lot more functionality than just that. 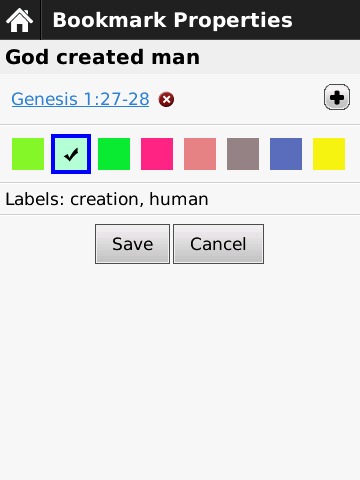 For example, you can choose a highlight color, add a title to your bookmark—even label it. Bookmarks are great for sharing special passages with friends, better organizing your personal studies, or for whatever purposes your imagination and creativity lead you to. Fixes.While this release also includes the standard “bug fixes” and “performance enhancements,” the most significant thing we addressed this time around was repairing a troubling issue that was causing freezes for some users under certain conditions. That shouldn’t happen anymore, and the Bible App should be noticeably faster at many common tasks. Please help us get the word out. 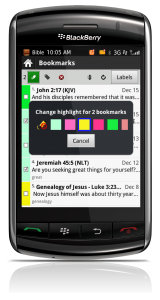 If you have friends with BlackBerry devices, a new release of the Bible App offers a great opportunity for you to share YouVersion with them. Please consider helping your friends who have never tried the Bible App get it installed and start their own free YouVersion account. Everything we do is always completely free. Our simple vision has always been to make it as easy as possible for people to engage freely with God’s Word, no matter where you live or what language you prefer. And remember: The YouVersion community on Facebook and Twitter loves hearing your stories about spreading the Bible App! Do you use the Bible App for BlackBerry? If so we want to give you a heads up about a problem that is popping up for a small segment of our BlackBerry community. We’re very sorry for the frustration some of you have experienced with an unstable app. We have been battling a tricky error that causes the app to freeze for some people, but not for everyone. This bug has been challenging to find, but it appears to be related to how we have integrated BlackBerry Messenger into the Bible App. To get this fixed, we are pushing as hard as we can to get a new release out to you. This new release will not have the BBM integration, but there is a lot to look forward to: highlights, improved bookmarking, and a few other speed enhancements that should really improve your experience within the app. We look to bring back BBM integration as soon as we are able to solve these issues. We are finishing up the app and will be testing it rigorously before it gets submitted to RIM for approval. That means the new build with improved features should be in your hand in about two weeks. That really does seem like a long time given how long you’ve had to wait, but it is 100% necessary to give everyone the stable release you’ve been waiting for. 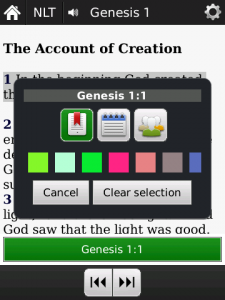 Again, our apologies for the problems you’ve encountered in using the Bible App for BlackBerry. Thank you for your patience and for working with us to troubleshoot the issue. We¹ll keep you informed as much as possible and we’ll certainly have a post here on the blog when the new update is available!